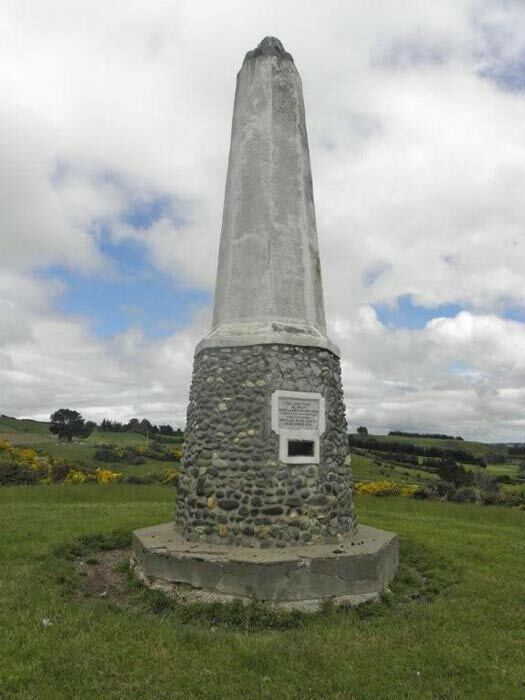 This memorial was erected in 1937 to mark the centennial of the battle at Tuturau, between Mataura and Wyndham in Southland. Te Pūoho, a Ngāti Tama chief, had travelled down from the North Island and was seeking to conquer Ngāi Tahu in the far south. He had hoped to skin the Ngāi Tahu 'eel from tail to head'. After a small victory at Tuturau, where he captured a handful of local people, he was attacked and killed by Ngāi Tahu warriors led by Tūhawaiki.